Engage in Budgeting: It is a good idea in college to budget your expenses with the income (coming from the help of your parents or from student loans). When you receive your semester loan, you can pay the rent for 4 to 6 months in advance that way you do not have to worry about that just in case you end up using money on other expenses. Use spreadsheet to write your expected expenses such as rent, utility, car, parking, and food. These can help you manage your money better if you are aware of the upcoming expenses of every month. 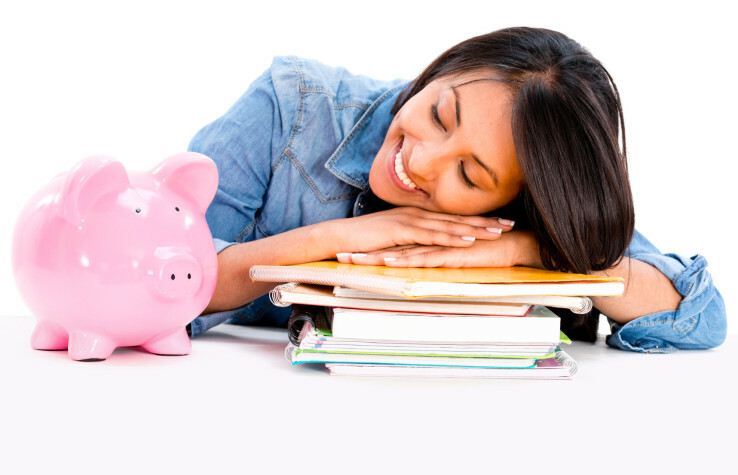 Make a Student Bank Account: Many banks serve certain campuses and offer special accounts for students. These accounts have no minimum balance requirements. Make sure that you choose a bank that has lots of ATMs all over the campus that way you do not need to commute or walk far away to access your bank account or withdraw money. Be Smart about Living Expenses: Many students hate to live with their parents while attending college. Moving out may seem like the most appealing idea. However, staying with parents saves you a lot of money compared to living in the dorms or campus apartments. Free rent is always good especially when you are not making much money and attending school full-time. Get Tutoring When You Need Help: Failing should not be an option. When you struggling with a class, hire a private tutor for a few sessions and budget for it. It is better to get a tutor than retake a class when you fail. It also looks bad on your transcript. If you fail a class, the school does not give you any money back. That’s gone money and you will be repaying for the same class. Cook to Save Money: Spending 100 to 200 dollars per month is totally worth it if you will be cooking. Eating outside food costs $7 per meal on average (assuming you are not eating McDonalds or Burger King every day). You should learn some recipes easy and fast and cook at home to eat healthier and cheaper meals. Cooking even about 7 to 10 meals a week really helps your budget. Get a Part Time Job: If you have certain semester where the workload is light then pick up a job. Making a few extra dollars a week really helps. There are on-campus and off-campus jobs available to students on a part time basis. Some are federal work study positions and other campus jobs available on every campus to students. Make good use of the opportunity available to you. Federal word study positions are only available to students with financial need on their financial aid package. Learn about your student loans: A good majority of the students take out student loans to pay for college. Go back and learn which loans you have taken out and the percentage of interest rate on it. If you took out subsidized loans, you do not have to pay interest on them until after you graduate because the government pays the interest for you. If you took out unsubsidized student loans, the interest in accruing on them while you are in school. If you took out plus loans, the interest is also accruing when you are in school and these loans may be at a higher percentage than subsidized or unsubsidized student loans. It is a good idea to pay some of the interest if you have a part time job on plus loans and unsubsidized loans. Remember when you graduate, you have 6 months before your payment starts for repayment of student loans but your interest is accruing during that time period. Therefore, if you find a job right away then start paying these loans despite of not being on a repayment plan until after 6 months. You can pay your loans whenever you want. Be Careful With Credit Cards: In college, you are at an age when you are old enough to have credit cards. Be cautious in using credit cards for unessential items. You will have debt for the rest of your life and your credit history may be affected years from now. Only take out money that you can pay back. We offer tutoring online all over United States and in person tutoring to students in the Phoenix Valley. We tutor students from elementary to college level.